The two stories &quot;The Loons&quot; by Margaret Laurence and &quot;Borders&quot; by Thomas King demonstrates the struggles that the first nations have to face in their lives. The First Nations and Metis people have a prominent place in Canada because this is their land. They have a strong connection to each other that is illustrated through Canadian literature. The two stories "The Loons" by Margaret Laurence and "Borders" by Thomas King demonstrates the struggles that the first nations have to face in their lives. The First Nations and Metis people are confused because they are Native Indian, but also Canadians. In both of the stories, the First Nations and Metis people are struggling against society. Each writer portrays the native Canadian in his or her own way. Margaret Laurence and Thomas King have succeeded in showing their different struggles. In the first story, Piquette wanted to be white like Vanessa, and wanted acceptance by the society. She was unfortunately a half breed, Metis, which alienated her. 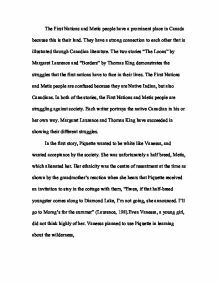 Her ethnicity was the centre of resentment at the time as shown by the grandmother's reaction when she hears that Piquette received an invitation to stay in the cottage with them, "Ewen, if that half-breed youngster comes along to Diamond Lake, I'm not going, she announced. I'll go to Morag's for the summer" (Laurence, 198).Even Vanessa, a young girl, did not think highly of her. Vanessa planned to use Piquette in learning about the wilderness, It seemed to me that Piquette must be in some way a daughter of the forest, a kind of junior prophetess of the wilds who might impart to me, if I ...read more. Before the people were Canadian or American, they were Blackfoot. When she tries cross the Canadian border to visit her daughter in America she is asked what is her citizenship and replies Blackfoot. This answer is unacceptable to the immigration offer because there is either Canadian or American citizenship. The mother shows her persistence by continuously driving to the border after being rejected repeatedly. The boy thinks that the mother should just say that she is Canadian and get over with it and does not realise the principle. "It would have been a lot easier if mom had just said Canadian and been dong with it, but I could see that she was not going to do that"(King, 188). Just by his reaction it could be seen that the mother was serious and was vehement about her culture. The guard consults a few people and it is determined that they have Blackfoot on both sides of the border and for "legal technicalities" (King, 189). The mother would have to shun her identity and adopt a new one. She does not question her ethnicity and does not care about being Canadian. The boy, on the other hand, tells the officer that they are Canadian, but because he is a minor, they do not listen. The boy does not follow the same principle as his mother does, although he seems to understand her nature. ...read more.
. Vanessa believes that only someone of Piquette's race would possess such knowledge of the wild; therefore, she tries to exploit Piquette's supposed wisdom. Vanessa, ultimately, saw Piquette as useless to her because she did not tell her any secrets and was not interested in nature or the loons. "It became increasingly obvious that, as an Indian, Piquette was a dead loss" (Laurence, 200). In the story, "Borders" the symbolism is that the Blackfoot people are on the border. They have to choose whether they are Canadian or American. This choice was unacceptable to the mother because she considered herself as Blackfoot and nothing else. The son on the other hand, recognised that he was from Canada. The mother was proud because when she spoke to Laetitia, she had them tell the story many times and they did so because they were proud of themselves. "She had se tell her the story over and over again" (King,194). The mother was seen as an inspiration of strength and Piquette could be seen as weakness. They had to face their own battles and Piquette just gave up. The authors prove that the First Nations and Metis people different approaches to various scenarios, yet they are dejected by society because of their ethnicity. The white man has been superior in both cases, although the mother's pride and allowed her to rise above and show society that she can overcome the struggles. Piquette, a young and immature girl, did not have the strength or the confidence to face anyone, including herself. ...read more. the slow 's' at the beginning builds up to the harsh 't' sound at the end. This makes your mouth spit the word out like a foul tasting piece of food. This connotation with disgust makes clear Stephen Lawrence's opinion of the killers. From a father to a daughter. They disgraced and mocked our religion when they applied cow and pig fat oil on the gun cartridges. They are treating me as if I am a traitor when I'm in prison. Now I have devoted my time for prayer and I hope Vishnu would answer them and make India a powerful and foreign free nation in the world.